Combine the simplicity of a dry erase board and the power of a computer with an interactive whiteboard. 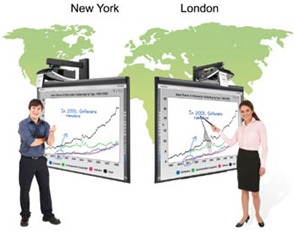 Interactive whiteboards bring collaboration to any environment – and best of all, it’s easy. Collaborate with colleagues. Deliver dynamic information in your presentation. You can communicate more productively, efficiently and interact through digital technology. With collaborative solutions, conferencing becomes a visual, interactive experience, and keeping records of meetings is effortless. Teamwork is a collaborative, inclusive process that produces valuable ideas, whether your colleagues are in the same meeting room or on different continents. Collaboration isn’t about technology. It’s about people, ideas and the ability to bring them together in a meaningful way – and most of all, we make it easy. We welcome you to explore our collaboration solutions – Interactive White Boards, Teleconferencing, Video Conferencing, Audio-Video Integration.